It has a New Title, and it will now be published in the spring of 2015 by Whitecap. Includes Susan Musgrave's highly coveted sourdough bread recipe and more in "From the Forage of the Oven" a chapter on beach combing and wash-up and a recipe for Shipwrecked Chicken Wings; in "A Rogue's Galley", and you will read about a local fisherman who offered an exotic dancer 50 lbs of shrimp to spend the night with him, and a famous politician's recipe for Rustled Beef by Gaslight. is on the August 10, 2014 BC Bestseller's List! 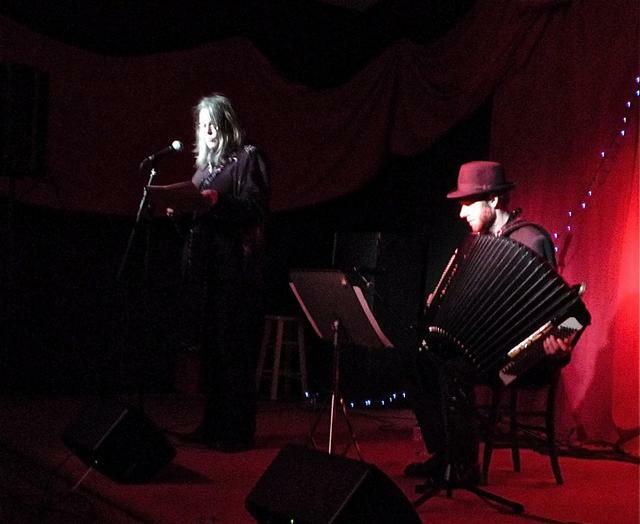 Susan's spoken word poetry + Dominic's pump organ accompaniment. will be available in the spring of 2015. Some remarkably successful live shows led to this album's immaculate conception. Inspired by Haida Gwaii, and the Sangan River on which they both live, a mere stones throw away from each other. from Two Story Productions Inc.
a few of our freelance book reviewers to choose some of their favourite reads of 2013.
and Dennis Lee’s Civil Elegies in the Anansi A List." Poet and Writer reflects on her next chapter as cookbook author and owner of an eclectic Haida Gwaii guest house. The author and poet Susan Musgrave discusses life on Haida Gwaii, poetry, education, and the collection she’s edited, Force Field: 77 Women Poets of British Columbia (Mother Tongue Publishing, 2013), with Joseph Planta. Force Field: 77 Women Poets of British Columbia edited by Susan Musgrave (Mother Tongue Publishing, 2013). I am Planta: On the Line, in Vancouver at TheCommentary.ca. CBC's The Next Chapter Shelagh Rogers, Susan Musgrave interview will be broadcast on Monday, May 27th,just after 1:30 pm, and then again on Saturday, June 1st, just after 4:30 pm. We'll also post an unedited version of the interview with Shelagh as a podcast on TNC's website www.cbc.ca/thenextchapter on May 27th. Origami Dove, has broken through to a new level of consciousness. 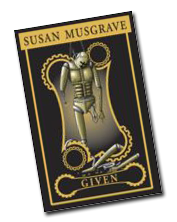 Susan Musgrave is the author of 27 books, of poetry, fiction, nonfiction and children's literature. She recently won the B.C. Civil Liberties Association Liberty Award for art and the Spirit Bear Award, which honours writers who make a significant contribution to the poetry of the Pacific Northwest. Musgrave dropped by North by Northwest to talk about her latest novel, Given , which is a sequel to her earlier novel Cargo of Orchids. The book is full of ghosts and dreams, and characters who live on the margins in various ways. Its themes include motherhood and loss. The narrative opens dramatically with an accident on a California highway, in which a prisoner facing a death sentence escapes and heads up the coast to British Columbia, where she reunites with her husband. That's just the beginning of an action-packed story. “One Wild Best Friend” on the iLit Digital Collection which has now been posted on the site: www.ilit.ca. Desperately Seeking Susans - A Review. Taking its title from the 1985 movie about a housewife who gets amnesia and is mistaken for a drifter, Sarah Yi-Mei Tsiang’s anthology charts the wildly diverse lives, experiences, and perspectives of Canadian poets exclusively called “Susan”. “Essay in “On Freedom, Spirit, Art and State in Manoa: A Pacific Journal"
Canadian Susan Musgrave; American Thersa Matsuura, now living in Japan; and Filipino Jose Y. Dalisay Jr. Poetry is by Chinese writer Chen Dongdong; Burmese Khin Aung Aye, Thitsar Ni, and Tin Moe; and Americans W. S. Di Piero, Tess Gallagher, Melissa Kwasny, and Naomi Long. year’s best in Canadian books for children from birth to age five that are fun to read and help build early literacy skills.